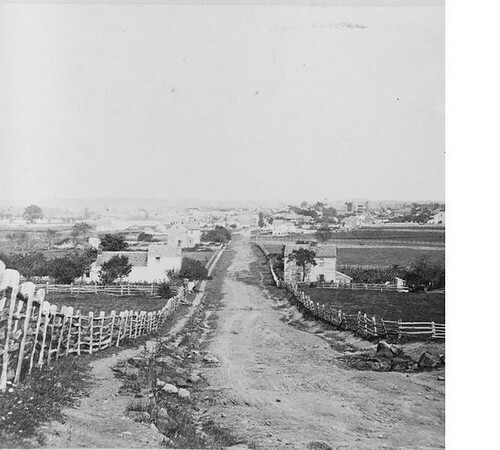 Gettysburg, was a quiet middle southern Pennsylvania town whose only claim to fame, at it were, was the Lutheran Seminary, founded in 1832, which has become Gettysburg College. There wasn't anything to distinguish this place from countless other places in the United States, even during the early years of the Civil War. We all know that completely changed at the end of June in 1863. Briefly, General Robert E. Lee decides to take the war to the Union. He'd just won at Chancellorsville, Virginia, although he'd lost Stonewall Jackson in the fight. He felt, if he took war north, where people weren't experiencing it, beat the Union army on their own soil, they would sue for peace to prevent this awful thing from happening in their land. Lee moved his army north and was in Chambersburg, Pennsylvania on June 28th when he received word that the Army of the Potomac was heading towards him. The story goes that Confederate soldiers, desperate for shoes, were spotted breaking into a cobbler's store in downtown Gettysburg. This is probably a fallacy. What is known is that the first real shots of a battle that would consume 3 days were fired at 7:30 a.m. on July 1st. We think of the southern forces as attacking from the south but they were north and west of the town and this is where the battle began. The red line marks the Confederate travels. The blue line marks the Union travels. There is no right or wrong way to tour the battlefield, but, when Carole and I visited in 2001, we did things chronologically. Monuments are everywhere. 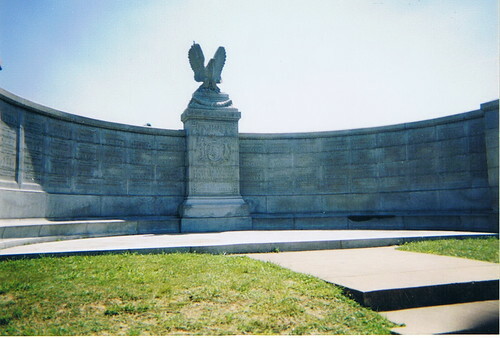 Every state that provided troops to either army has a monument where they camped or where they died. 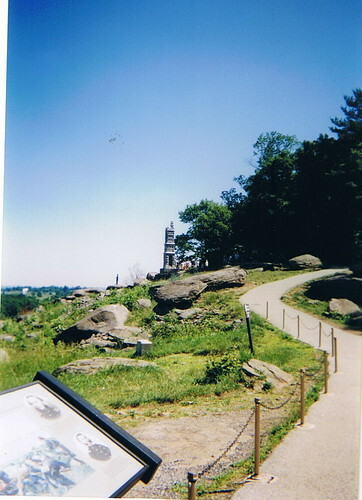 This monument, unveiled by Franklin Roosevelt on the 75th anniversary of the battle, is north of town, near the site of the first shots being fired. There were, at the time of dedication, a few veterans of that war still alive. 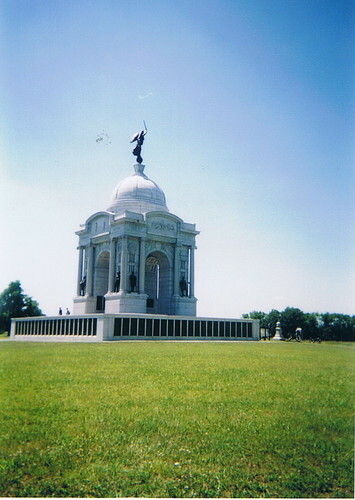 Pennsylvania has the biggest and, it could be argued, most ostentatious monument on the battlefield. You used to be able to climb stairs in each corner of the monument to have a wide view over the section of battlefield where Pickett's Charge was. This is considered the 'high water mark' of the Confederacy, the farthest north they ever got. The stairs are closed now as it's too dangerous to climb them. 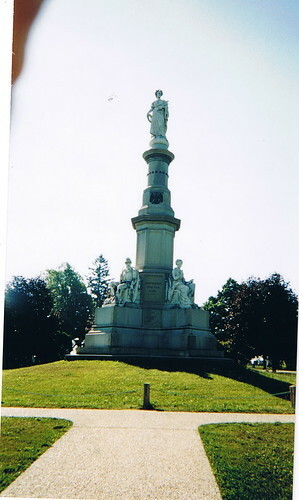 This is the monument in the center of the Gettysburg Civil War cemetery. This was not here when Lincoln gave his address on a blustry November day. We are met on a great battlefield of that war. We have come to dedicate a portion of it, as a final resting place for those who died here, that the nation might live. This we may, in all propriety do. But, in a larger sense, we can not dedicate -- we can not consecrate -- we can not hallow, this ground -- The brave men, living and dead, who struggled here, have hallowed it, far above our poor power to add or detract. The world will little note, nor long remember what we say here; while it can never forget what they did here. I've been in a lot of cemeteries in my life. None seemed quite so somber as this one. Even the traffic passing on a nearby highway seemed muted. This is the 150th anniversary of that conflict. It's a conflict we have never resolved. The defeat of the Confederacy preserved a nation. We are stronger together than we would have been had we split apart. But the echos of what each side fought for still ring through us. Gettysburg is alive, today and through this coming weekend, with reenactors and the public. It doesn't seem right to call this a "celebration". What are we celebrating, exactly? A war that tore families and communities and a country apart? It's rather a remembrance, an anniversary. Walking amongst the memorials and the monuments, driving the paths that the armies marched, stopping where they camped and standing overlooking what they saw is a sobering experience. It's not a place to whoop and holler. I felt overcome with reverence every place we walked, every place we stopped and stood and read the plaques and took photos. I didn't have family, to the best I can determine, in this war. We were in the US at the time, living in Iowa, but no one went off to war. Hence, I'm a bit detached from this place. There is not an ancestor with ties to this ground. But there is a tie we all share. Of all places in this country, three of them stand out to me as anything that could be considered shrines; the 9/11 memorial in New York, the Arizona Memorial in Hawaii and Gettysburg National Battlefield. Each place represents freedom. It was accident or fate that brought two armies here. Independence Day was little remembered on July 4, 1863. It rained. It poured on Confederate and Union armies alike. It took 3 days to bury the dead and many more months before the wounded survivors could leave this place. Yet, it was this small town, nondescript, that gave us the country and the freedom we guard jealously to face future assaults. 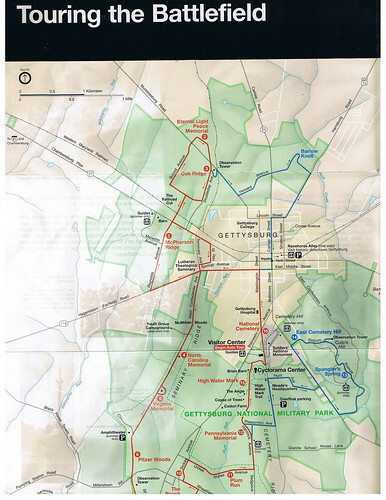 If you have a "bucket list", Gettysburg needs to be on it. You can't help but think about what transpired. You can't help but be moved. Will it change you? No, possibly not, but every American should, in their lifetime, stand amongst the monuments and think about what these men fought for. We have endured Mr. Lincoln.